Oracle’s second annual survey finds slow progress on AMI-utility operations integration. North American utilities have installed nearly 50 million smart meters across their service territories, ranging from massive investor-owned utility deployments that count into the millions, to rural co-op and municipal systems that number in the thousands. What have they done with all that new technology so far? On Tuesday, Oracle released its second annual survey on that topic, and the findings are mixed. 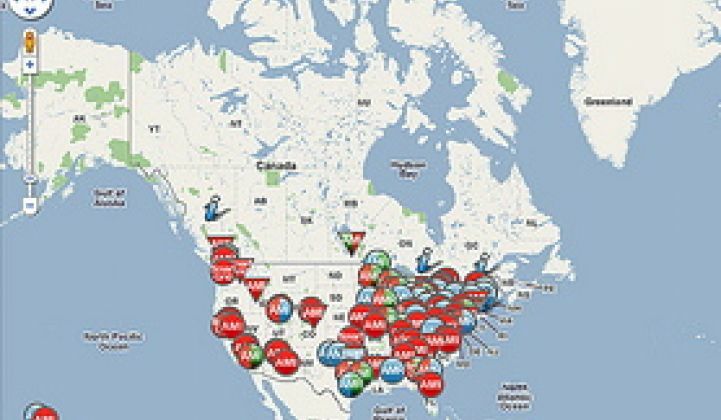 While utilities have certainly been making progress over the last year in integrating their AMI networks into broader utility operations, they’re still not doing all they can with them -- particularly when it comes to making use of the enormous amounts of useful data those millions of endpoints represent. Compared to last year’s survey, which also polled 150 utility executives in the United States and Canada, progress is certainly being made, said Brad Williams, vice president of industry strategy for Oracle. That’s shown in both the overall progress of utility AMI deployments from pilot project to full operational rollout, as well as the scope of functionality they’re deriving from those deployments. This chart illustrates the gap across several utility operations categories. 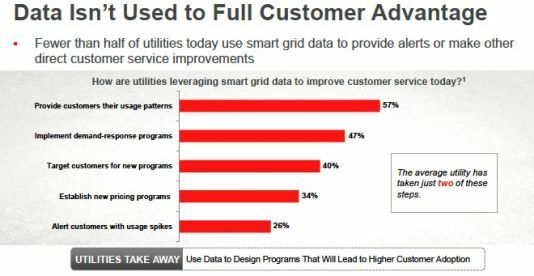 As it indicates, using smart meters to better manage outages is one of the fully developed uses of smart meter data, with many utilities and vendor integration projects bringing those endpoint data sources into the broader utility systems for detecting outages and helping restore them. Collection of interval meter data and voltage data for analysis purposes is also a growing trend, though fewer utilities are actually using that data for operational purposes than are simply collecting it, Williams noted. Using AMI data for diagnostics and tamper detection -- a key role that smart meters can play in energy theft detection -- is an area that is less developed. “As smart metering projects near completion, or are completed, this is the next phase of that kind of project: using the data to drive value,” Williams said. As Guerry Waters, Oracle vice president of utility strategy, noted, turning on these kinds of customer-facing systems requires a lot of backend integration to be effective. “You have to have a system in place to manage something like this,” he said. “You couldn’t use your legacy CIS [customer information system] to make this happen.” CIS systems, which make up some of the oldest and clunkiest parts of the typical utility back-office enterprise system, need to be upgraded to more modern IT standards to integrate all the new data that can be put to use, he said. On the subject of big-data integration, Waters noted that the first challenge utilities have faced in simply managing the flood of data coming from millions of smart meters “has moved more to the background now,” as utilities leverage techniques and best practices from other industries familiar with massive data flows, such as telecommunications. “The next frontier is going to combine this with deeper analytics, with the granular data we’re now getting from the customer,” he said. On that front, utilities are still moving slowly, he said, as the following chart indicates. Oracle has a lot of projects that are using AMI data as part of a broader set of data to drive reliability across the utility enterprise. So are others, such as utility back-office competitor SAP, system integrators like Infosys, IBM, Accenture, and Capgemini, startups such as big-data integration expert C3 Energy, and big grid companies such as ABB/Ventyx, Siemens, and General Electric with its Grid IQ Insight analytics platform, to name a few. The IT challenges inherent in merging a large number of disparate data sources into useful information are also driving more utilities to consider cloud computing alternatives to managing the process themselves, Williams noted. Even so, relatively few utilities are adopting cloud-based solutions at present, despite the fact that a larger portion recognize the value in doing so, as the next chart demonstrates. Williams described the current state of utility adoption of cloud computing as the “testing the waters” phase. “Utilities want to accelerate the adoption of getting more information from their data,” adding, “Cloud solutions are really kind of an obvious choice to do that."